(2) Takahara S, Lee SY, Iwakura T, Oe K, Fukui T, Okumachi E, Waki T, Arakura M, Sakai Y, Nishida K, Kuroda R, Niikura T. Altered expression of microRNA during fracture healing in diabetic rats. Bone Joint Res. 7(2):139-147, 2018. (3) Ueha T, Oe K, Miwa M, Hasegawa T, Koh A, Nishimoto H, Lee SY, Niikura T, Kurosaka M, Kuroda R, Sakai Y. Increase in carbon dioxide accelerates the performance of endurance exercise in rats. J Physiol Sci. 68(4):463-470, 2018. (4) Shoda E, Kitada S, Sasaki Y, Hirase H, Niikura T, Lee SY, Sakurai A, Oe K, Sasaki T. Proposal of new classification of femoral trochanteric fracture by three-dimensional computed tomography and relationship to usual plain X-ray classification. J Orthop Surg (Hong Kong). 25(1):2309499017692700, 2017. (5) Lee SY, Niikura T, Iwakura T, Fukui T, Kuroda R. Clinical Experience With the Use of Low-Intensity Pulsed Ultrasound (LIPUS) in the Treatment of Atypical Femoral Fractures. J Orthop Trauma. 31(7):S2, 2017. (6) Akahane S, Sakai Y, Ueha T, Nishimoto H, Inoue M, Niikura T, Kuroda R. Transcutaneous carbon dioxide application accelerates muscle injury repair in rat models. Int Orthop. 41(5):1007-1015, 2017. (7) Arakura M, Lee SY, Takahara S, Okumachi E, Iwakura T, Fukui T, Nishida K, Kurosaka M, Kuroda R, Niikura T. Altered expression of SDF-1 and CXCR4 during fracture healing in diabetes mellitus. Int Orthop. 41(6):1211-1217, 2017. (8) Kumabe Y, Lee SY, Waki T, Iwakura T, Takahara S, Arakura M, Kuroiwa Y, Fukui T, Matsumoto T, Matsushita T, Nishida K, Kuroda R, Niikura T. Triweekly administration of parathyroid hormone (1-34) accelerates bone healing in a rat refractory fracture model. BMC Musculoskelet Disord. 21;18(1):545, 2017. (10) Niikura T, Lee SY, Iwakura T, Sakai Y, Kuroda R, Kurosaka M. Antibiotic-impregnated calcium phosphate cement as part of a comprehensive treatment for patients with established orthopaedic infection. J Orthop Sci. 21(4):539-45, 2016. (1) Takase K, Lee SY, Waki T, Fukui T, Oe K, Matsumoto T, Matsushita T, Nishida K, Kuroda R, Niikura T. Case Rep Orthop. Minimally Invasive Treatment for Tibial Malrotation after Locked Intramedullary Nailing. Case Reports in Orthopedics.2018 Aug 23;2018:4190670. doi: 10.1155/2018/4190670. eCollection 2018. (2) Matsuo T, Lee SY, Iwakura T, Fukui T, Oe K, Matsumoto T, Matsushita T, Nishida K, Kuroda R, Niikura T. Locking plate osteosynthesis for a femoral fracture and subsequent nonunion in a patient with osteopetrosis. Int J Surg Case Rep. 2018;51:395-399. doi: 10.1016/j.ijscr.2018.09.013. Epub 2018 Sep 17. 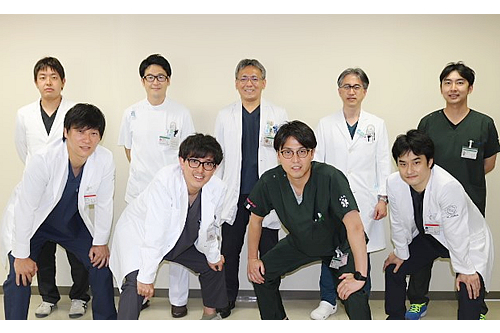 (3) Kitayama K, Kawakami Y, Fukui T, Oe K, Kuroda R, Niikura T. Rescue of ankylosing hip following open reduction and internal fixation of acetabular fracture by surgical resection of heterotopic ossification: A case report. Int J Surg Case Rep. 2018;53:107-111. doi: 10.1016/j.ijscr.2018.10.022. Epub 2018 Oct 19. (8) Lee SY, Niikura T, Iwakura T, Sakai Y, Kuroda R, Kurosaka M. Bicondylar hoffa fracture successfully treated with headless compression screws. Case Rep Orthop 139897, 2014. (11) Takahara S, Oe K, Fujita H, Sakurai A, Iwakura T, Lee SY, Niikura T, Kuroda R, Kurosaka M. Missed massive morel-lavallee lesion. Case Rep Orthop 920317, 2014.